Postmaster General John Potter testifies on Capitol Hill in Washington on the financial stability of the Postal Service. 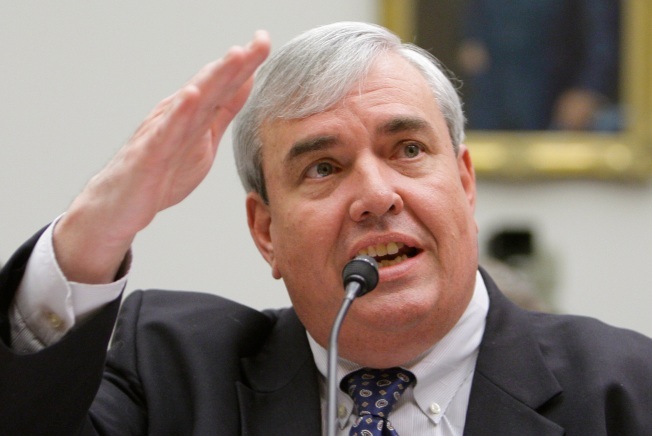 Postmaster General John Potter said Wednesday the financially strapped U.S. Postal Service will run out of money this year without help from Congress. The only lingering question, Potter told a House subcommittee, is which bills will get paid and which will not. He did say ensuring the payment of workers' salaries comes first. But Potter also said other bills may have to wait. Potter's appearance came as the agency, which has lived on a reputation of serving through wind, rain and all sorts of obstacles, seeks permission to reduce mail delivery to five days a week. It also wants to change the way retiree health benefits are amassed to save money. "We are facing losses of historic proportion," he said. "Our situation is critical." The Postal Service was $2.8 billion in the red last year and is facing even larger losses this year due to a sharp decline in mail volume in the weak economy. Potter broached the possibility of cutting mail delivery from six days to five in January, but the idea has not been warmly received in Congress. "With the Postal Service facing budget shortfalls the subcommittee will consider a number of options to restore financial stability and examine ways for the Postal Service to continue to operate without cutting services," subcommittee chairman Stephen F. Lynch, D-Mass., said. Lynch said the financial stability of the Postal Service is "critical to the American expectation of affordable six-day mail delivery." The post office is also seeking changes in its required pre-funding of medical costs for retirees that could cut its annual costs by $2 billion, a move endorsed by several subcommittee members. "We are not here today to ask for a taxpayer bailout, but we are here to ask the Congress for help," William Young, president of the National Association of Letter Carriers, said in his prepared testimony. "At this moment, the survival of the Postal Service — a venerable institution that is literally older than our country — hangs in the balance," he added. Even if the agency succeeds in reaching its planned cost cuts of $5.9 billion, there could still be a $6 billion deficit in 2010, Potter told the House Oversight Subcommittee on the Federal Work Force and Postal Service. "Without a change we will exhaust our cash resources," Potter said. "We can no longer afford business as usual." He estimated that delivering mail five days-a-week instead of six would save $3.5 billion per year. Asked if layoffs would occur, Potter said it is possible, but he hopes avoidable. Last week the post office said it planned to offer early retirement to 150,000 workers and is eliminating 1,400 management positions and closing six of its 80 district offices across the country in cost-cutting efforts. Dan Blair, head of the independent Postal Regulatory Commission, suggested in his testimony that other savings could be realized through closing small and rural post offices — something Congress has resisted in the past. He added that it may be necessary to increase the limit on the amount of debt the post office can carry. The post office had a $384 million loss in the first quarter of the fiscal year — October through December — which is usually the busiest period because of the holidays. Officials said the recession has contributed to a mail volume drop of 5.2 billion pieces compared to the same period last year. If there is no economic recovery, the USPS projects volume for the year will be down by 12 billion to 15 billion pieces of mail. Over the past year the post office says it has cut 50 million work hours, stopped construction of new facilities; frozen salaries for executives, began selling unused facilities and has cut post office hours. Last year's high fuel prices also sapped funds from the post office, which operates more than 200,000 vehicles. Every one-cent increase in the price of fuel costs the post office $8 million. Blair also noted that Congress could consider appropriating money to help the post office. Currently the agency does not receive a taxpayer subsidy for its operations, although Congress does subsidize overseas voting and free mail for the blind. Lawmakers raised questions regarding recent news reports which said Potter is paid as much as $800,000-a-year. That is not correct, Potter said. He said his salary, set by Congress, is $263,575. He said the news reports were also counting his retirement fund, the cost of his security detail and a $135,000 bonus which would be paid over 10 years after he retires. The bonus is based on improved delivery rates and customer satisfaction, he said. Under the current financial conditions, Potter said, he would not be eligible for a bonus this year.